Genesis Puggsy (USA) in 18:00.73 by Sonikkustar. Puggsy is the story of an alien who makes a pit stop on a planet creatively called The Planet, only to have his spacecraft stolen by the raccoon natives! 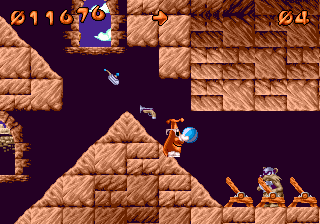 In order to get Puggsy's ride back, Sonikkustar abuses the impressive physics engine and the variety of puzzle-solving items dotted around the levels, thrashing the raccoons in record time!